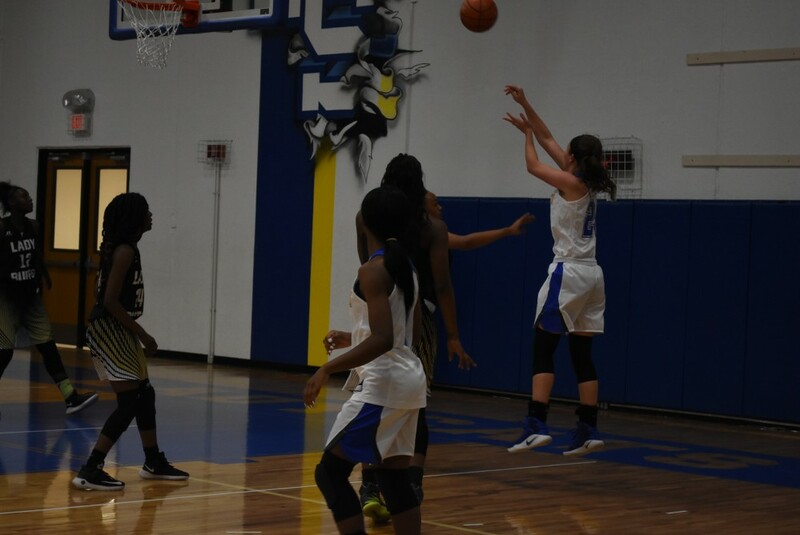 With the Lady Cats’ basketball team forced to play shorthanded due to an ankle injury to Autumn Tanton, other members of the team had to pull more weight and that’s what they did as the Lady Cats won their district opener at home against Greenville, 66-37 Tuesday night (December 12). The team’s top two scorers, Kaylee Jefferson and Sadavia Porter both had big nights. Porter had a so-so first two quarters but then busted loose in the second half to end up with 25 points including two three-point baskets. Jefferson scored 11 big first quarter points to help get the Lady Cats going and ended up with 21 points. Jamia Hall, who got a chance to start, poured in four baskets for 8 points. Danielle Godbolt hit a three point basket and scored 5 points. Tareyla Kelley scored 4 points off of the bench. Imani Taylor added 3 points and had a team leading 6 deflections. The Lady Cats outscored the Lady Lions in every quarter and built their lead throughout the game. The Lady Cats led 14-11 after one quarter, 31-20 at half time, 51-28 after three quarters and 66-37 after four quarters. Statistically, the Lady Cats hit 29 of 62 shots for 47%. They were just 3 of 13 or 23% from three-point range. The Lady Cats made only 5 of 13 free throws for 38%. Jefferson grabbed 13 rebounds, Godbolt had 7 and Jamia Hall 6. The Lady Cats had 16 deflections and 17 steals and they committed only 10 turnovers. Tanton has now had problems with both of her ankles this year but Lady Cats Coach Jeff Chapman hopes she’ll be ready to go by Friday. The Lady Cats play at Hallsville Friday night. The #10 ranked Lady Cats are now 1-0 in district play and 13-2 for the season.